As close to a quarter million people descended on a city of six hundred thousand, CES 2018 became the perfect metaphor for the current state of modern society. Unfazed by floods, blackouts, and transportation problems, technology steamrolled ahead. Walking the floor last week at the Las Vegas Convention Center (LVCC), the hum of the crowd buzzed celebrating the long awaited arrival of the age of social robots, autonomous vehicles, and artificial intelligence. In the same way that Alexa was last year’s CES story, social robots were everywhere this year, turning the show floor into a Disney-inspired mechatronic festival (see above). The applications promoted ranged from mobile airport/advertising kiosks to retail customer service agents to family in-home companions. One French upstart, Blue Frog Robotics, stood out from the crowd of ivory-colored rolling bots. Blue Frog joined the massive French contingent at Eureka Park and showcased its Buddy robot to the delight of thousands of passing attendees. When meeting with Blue Frog’s founder Rodolphe Hasselvander, he described his vision of a robot which is closer to a family pet than the utility of a cold-voice assistant. Unlike other entrees in the space, Buddy is more like a Golden Retriever than an iPad on wheels. Its cute, blinking big eyes immediately captivate the user, forming a tight bond between robopet and human. Hasselvander demonstrated how Buddy performs a number of unique tasks, including: patrolling the home perimeter for suspicious activity; looking up recipes in the kitchen; providing instructions for do-it-yourself projects; entertaining the kids with read-along stories; and even reminding grandma to take her medicine. Buddy will be available for “adoption” in time for the 2018 Holiday season for $1,500 on Blue Frog’s website. Last year, one of the most impressive CES sites was the self-driving track in the parking lot of the LVCC’s North Hall. This year, the autonomous cars hit the streets with live demos and shared taxi rides. Lyft partnered with Aptiv to offer ride hails to and from the convention center, among other preprogrammed stops. While the cars were monitored by a safety driver, Aptiv explicitly built the experience to “showcase the positive impact automated cars will have on individual lives and communities.” Lyft was not the only self-driving vehicle on the road, autonomous shuttles developed by Boston-based Keolis and French company Navya for the city of Las Vegas were providing trips throughout the conference. 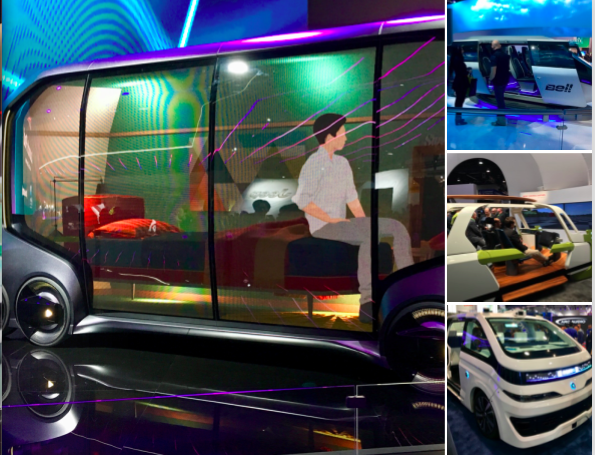 Inside the LVCC, shared mobility was a big theme amongst several auto exhibitors (see below). Torc Robotics made news days before the opening of CES with its autonomous vehicle successfully navigating around a SUV going the wrong way into oncoming traffic (see the video above). Michael Fleming, Chief Executive of Torc, shared with a packed crowd the video feed from the dashcam, providing a play-by-play account. He boasted that a human driven car next to his self-driving Lexus RX 450 followed the same path to avoid the collision. Fleming posted the dashcam video online to poll other human drivers to program a number of scenarios into his AI to avoid future clashes with reckless drivers. AI was everywhere last week in Las Vegas, inside and outside the show. Unlike cute robots and cars, artificial intelligence is difficult to display in glitzy booths. 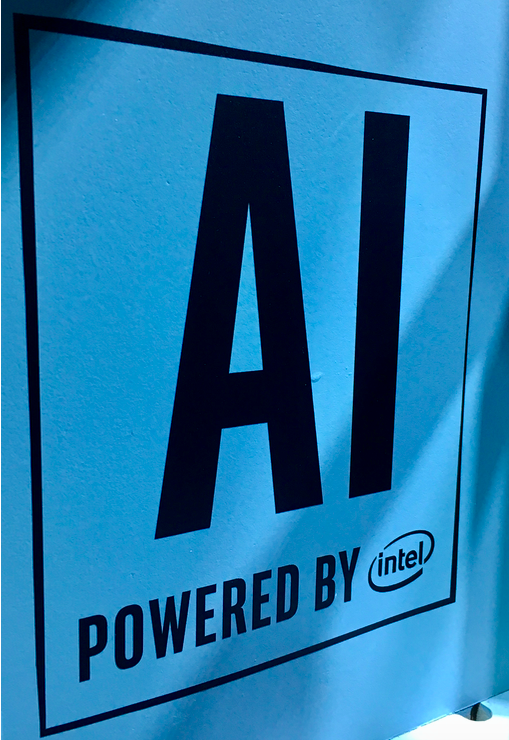 While many companies, including Intel and Velodyne, proudly showed off their latest sensors it became very clear that true AI was the defining difference for many innovations. Tucked in the back of the Sands Convention Center, New York-based Emoshape demonstrated a new type of microchip with embedded AI to synthetically create emotions in machines. The company’s Emotion Processing Unit (EPU) is being marketed for the next generation of social robots, self-driving cars, IoT devices, toys, and virtual-reality games. When speaking with Emoshape founder Patrick Levy-Rosenthal, he explained his latest partnership with the European cellphone provider, Orange. Levy-Rosenthal is working with Orange’s Silicon Valley innovation office to develop new types of content with its emotion synthesis technology. As an example, Emoshape’s latest avatar JADE is an attractive female character with real-time sentiment-based protocols. According to the company’s press release, its software “engine delivers high-performance machine emotion awareness, and allows personal assistant, games, avatars, cars, IoT products and sensors to feel and develop a unique personality.” JADE and Emoshape’s VR gaming platform DREAM is being evaluated by Orange for a number of enterprise and consumer use cases. Emotions ran high at CES, especially during the two-hour blackout. On my redeye flight back to New York, I dreamt of next year’s show with scores of Buddy robots zipping around the LVCC greeting attendees, with their embedded Emoshape personalities, leading people to fleets of Torc-mobiles around the city. Landing at JFK airport, the biting wind and frigid temperature woke me up to the reality that I have 360 more days until CES 2019.